We do not have to be crucified on pieces of wood! The godly life is not one of ease, pleasure and self-indulgence. We are taught to present our bodies, as a living sacrifice unto God. Ancient offerings were brought to the altar, and presented dead. But the Christian sacrifice, instead of being poured out in a bloody oblation, is to be a living sacrifice–of service, of love, of devotion. The great sacrifice of Christ is both the model for all Christian life, and also its inspiration. We look at His six hours on the cross–as if that were its only act and expression. But the cross was not endured by Christ merely during those six hours on Calvary; it was in all His life, in every day and hour of it. Everything He did was in love, and love is always a living sacrifice. He was always sacrificing Himself. On Calvary, He only wrote the word out in capital letters! The cross stands not merely for the sufferings of Christ endured in redeeming sinners–but also for the law of love and of sacrifice in every department of Christian living. It is not enough to have the cross on our churches, as a symbol of redemption; or to wear crucifixes as ornaments; the cross and the crucifix must be in the heart–and manifested in the life! We talk a great deal about the love of Christ–but we must strive to illustrate it and reproduce in our own lives, in our own measure–the sweetness, the charity, the kindness and the helpfulness of Jesus Christ. The cross is everywhere. The more of the ‘sacrificial’ quality we get into our life–the diviner and the lovelier our life will be. We do not have to be crucified on pieces of wood–to bear a cross, and make a living sacrifice. The cross must be in the lives of those who follow Christ; not branded on their bodies–but wrought into their character, their disposition, their conduct, their spirit! We cannot live a Christian life for a day, without coming to points of sacrifice. The cross of Christ does not take our own cross from us–Christ does not bear our cross for us. His cross becomes the law of our life, and makes it all sacrificial. Every sacrificial thing we do, reveals the cross. The Beatitudes are all sacrificial. No one can live the thirteenth chapter of First Corinthians, and not crucify self continually. All sacrifice at length blossoms into Christlike beauty, sweetness and joy. They were not to lay up in store–but were taught to live simply by the day. When night came, they did not have a supply of food left over for the next day–but were entirely dependent upon God’s new supply to come in the morning. This is a most valuable lesson for every Christian to learn. We should make a little fence of trust around each day, and never allow any past or future care or anxiety to break in. God does not provide in advance for our needs. We cannot get grace today–for tomorrow’s duties; and if we try to bear tomorrow’s cares and burdens today–we shall break down in the attempt. TIME comes to us, not in years, not even in weeks–but in little days. We have nothing to do with ‘life in the aggregate’ –that great bulk of duties, anxieties, struggles, trials and needs, which belong to a year or even to a month. We really have nothing to do even with tomorrow. Our sole business is with the one little day now passing, and the one day’s burdens will never crush us; we can easily carry them until the sun goes down. We can always get along for one short day–and that is really, all we ever have. Free Book from Grace to You! 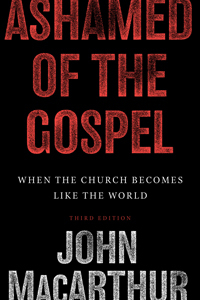 Grace to You (John MacArthur’s Ministry) is giving away a free book! Right now the sign up is only for those who are not currently signed up for GTY’s mailing list.Â However, if you are signed up, you will receive the offer by mail in March.Â Who all is excited about getting this book? Not on the mailing list and want to get Ashamed of the Gospel for free?Â Sign up now! There is a secret of victorious living which, if people knew it, would make all of life easier for them. It may be stated thus: that as we take up any duty and go forward with it, we shall receive the strength we need to do it. There are several Divine promises that give this assurance. One reads, “As your days–so shall your strength be.” Deuteronomy 33:25. This seems to mean that the help which God gives, varies according to the necessity of the particular day. God fits His blessing–to our days. When we are faint–He increases strength. When we are sorrowful–He gives comfort. When we are in danger–He grants protection. When we are weary–He gives rest. Another of Christ’s promises reads, “My grace is sufficient for you.” Every word of this assurance shines with radiant light. “My grace is sufficient for you.” It is Christ’s grace that is sufficient. We know that He has all Divine fullness, and therefore we are sure that no human need can ever exhaust His power to give help! “My grace is sufficient for you.” It is Christ’s grace that is sufficient. If it were anything else but grace, it might not give us such comfort. Grace is undeserved favor, goodness shown to the unworthy. We deserve nothing, for we are sinners. But it is Christ’s grace which is sufficient, and so we can claim it. “My grace is sufficient for you.” The word “sufficient” is one whose meaning expands and amplifies with the measure of the need. No necessity is so small as not to be included; and none is so great as to go beyond the capacity of the blessing that is promised. “My grace is sufficient for you.” The grace is sufficient for each of His redeemed children–“for you” the promise runs. Life lies before us, with . . . It does not come to us all in one piece. God breaks our years–into months and weeks and days, and never gives us more than just a little at a time–never more than we can bear or do for the day. If we take up the present duty or burden–we shall always have strength to do it. If we do not have strength of our own sufficient for the work or struggle, we need not falter–but should go on, just as if we had omnipotence in our arm; for as we obey God, though the task is impossible to our ability–He will sustain us by giving us all the help we need.